3 Connect with all of the major sources of customer feedback including SurveyMonkey, Zendesk and TrustPilot. Customer verbatims are the most powerful form of feedback. They allow you to uncover drivers behind your Net Promoter Score, Customer Satisfaction or Customer Effort Scores but they can be a pain at scale. Chattermill deploys an advanced neural networks model tailored to your specific data and digests messy qualitative data into clear quantiative insights for your entire team. 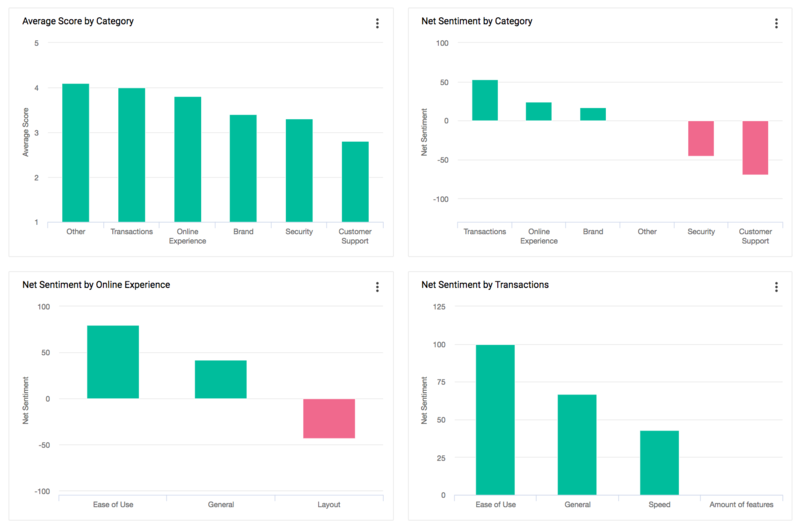 Our model extracts key drivers behind your customer experience and their sentiment in near real time. Chattermill integrates with all of your customer feedback channels including all of your SurveyMonkey surveys. We gather and analyse the data in real time meaning you don't need spreadsheets or slides to deliver insights from across your customer journey to the right stakeholder. Our dashboard was built specifically for extracting insights from free form feedback. You can slice and dice your data using the themes we uncovered or your customer attributes (including Custom Variables from SurveyMonkey) to find the right level of insight. Any chart allows you to go to raw feedback in one click when you need to get deeper. SurveyMonkey users use Chattermill to stream their Net Promoter Score, CSAT and other surveys containing a free form element where they need to understand the key drivers. The integration is very light touch, you log in with your SurveyMonkey account, tell us which surveys we should connect with and we take care of everything else. Reach out to your Chattermill Account Manager to enable the SurveyMonkey integration. We only pull the data you tell us from your SurveyMonkey surveys. You will need a basic subscription to Chattermill to utilise the SurveyMonkey integration.